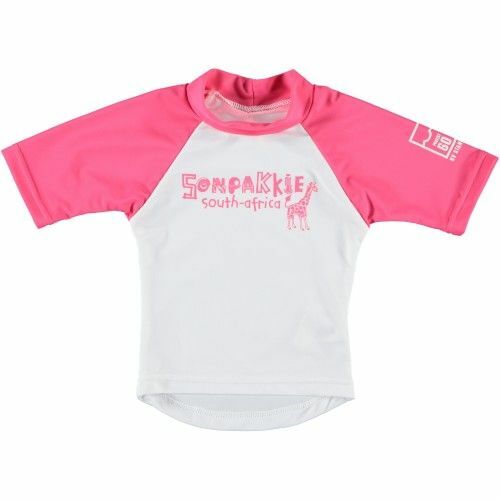 UV Swim Shirt 'Safari' (pink and white) with short sleeves by Sonpakkie. 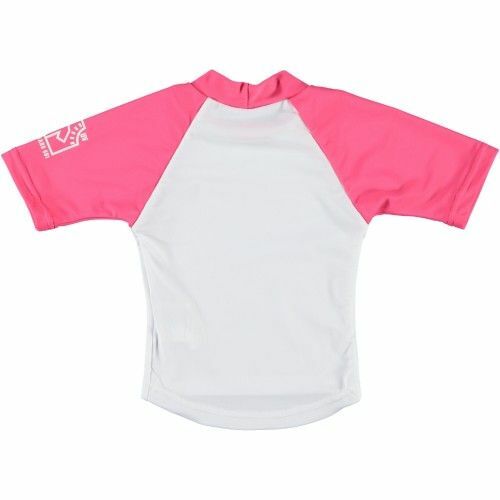 This cute UV protective swim shirt for baby's has a protection factor UPF 60. UV proof and UV protection swimwear protect your kids from the dangers of the sun. This cute Sonpakkie UV swim shirt with short sleeves has a print of a giraffe on the chest and is available in two baby sizes. With Sonpakkie UV swimwear your children are well protected from the sun and they look also super cool! Ideal for the beach or by the pool. All Sonpakkie UV protection and UV protective swimwear for babies and children has a protection factor UPF 60. • Sonpakkie UV swimwear is designed for active use. The UV swim shirts perfectly fit (tight, but not constricting) and are ideal to play both in the water and outside on the beach or in the garden. • Made from quick-drying material, making children less quicker cold. • Tested according to the most stringent global standards for sun protection (UV Standard 801). Sonpakkie UV Swim Shirts have a Protection Factor UPF 60.